Mother’s Day is right around the corner – May 13th, to be exact! Mother’s Day is a special day for honoring mother’s everywhere – and they deserve the best. Here at Buck Snort Lodge Products, we’ve got a few gift ideas for the special woman in your life. Bedding Looking A Bit Shabby? Her bedding is looking a bit shabby because she puts others in front of her. It’s time to treat her to luxirous softness and exquisite fabrics. Get her some 350 Thread count, 100% cotton, available in cream or chocolate bear sheets. Available in our online store. Time to Upgrade the Dishes? She’s still using the same dishes you used when you were a child – and they’ve seen better days. Time to upgrade her to shed horn dinnerware! Available as a 16 piece stoneware set in our store. 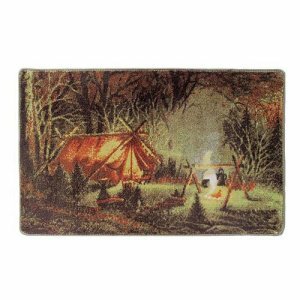 Missing that final piece of Terry Redlin Evening Solitude to complete her bathroom collection? We’ve got just the right ideas! Check them out today!